It’s still September, isn’t it? Barely? Good! September marks the anniversary of the release of one of my most very favorite books, The Flavor Bible! Last year I did a post about it and this year Karen and Andrew (the authors) were kind/terrifically sweet and generous enough to send me a copy of The Flavor Bible’s companion book, What to Drink with What You Eat, as well as a few bottles of wine to play with. There was a bit of a snafu with the delivering of said book (though the wine showed up quickly, at 9 p.m. from a refrigerated UPS truck…odd) which FedEx decided to send straight back after I wasn’t home to receive it, but Karen and Andrew just arranged to have it sent to me at work and all was well! So that explains why this post is just barely still in the month of September. It was frustrating having the wine around and no book to glean ideas from, though! Luckily it took me almost no time at all to decide what to do with the first wine. 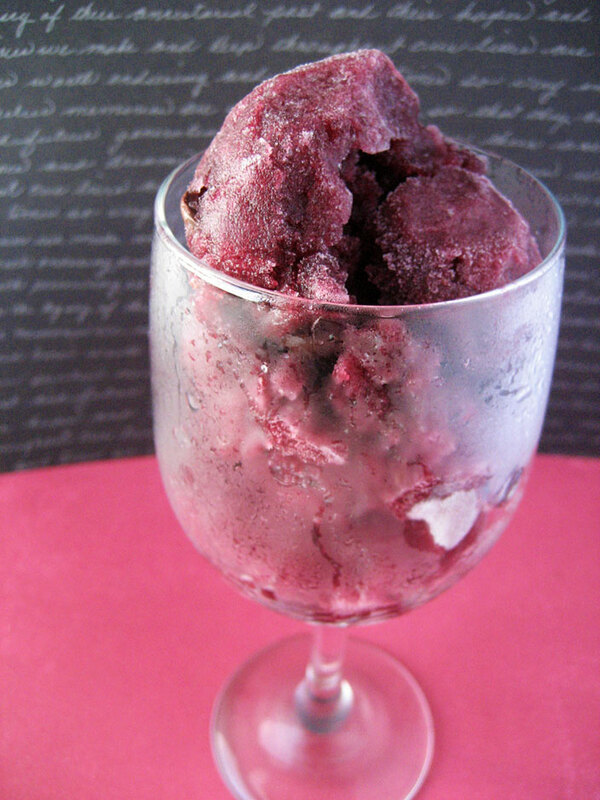 I’ve had an idea for a red wine-chocolate chip sorbet scribbled in my idea notebook since I moved to New York (actually I think it was scribbled in there as I was brainstorming to pass the time on the trip down) and I was excited to put it to use! I’m not much of a red wine fan – dry whites and the occasional rosé are more my speed (and, ok, hard liquor over everything if we’re really getting down to it) but one of the bottles I received was a gorgeous, deep purpley-red Cabernet-Sauvignon. 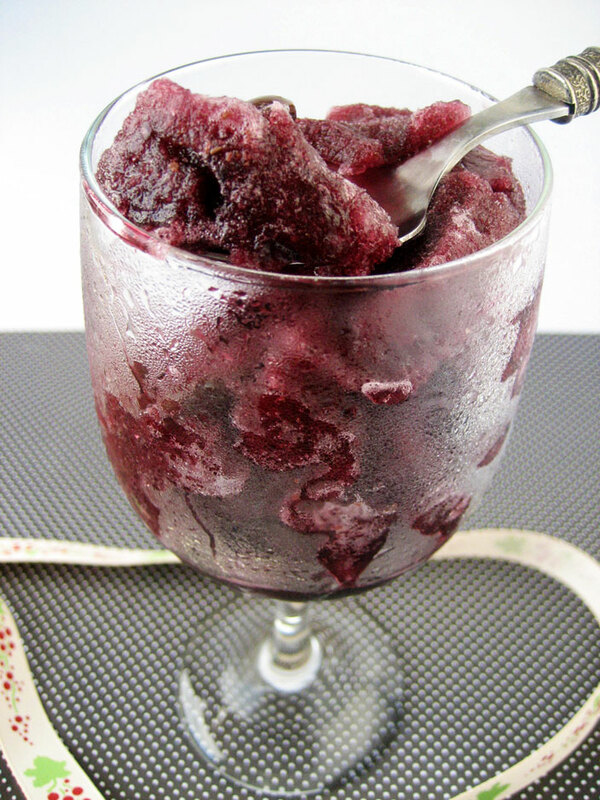 Not very sweet but not overly tannic either, the added sugar and spice in this sorbet really helped the wine achieve its maximum dessert potential, I think. Of course you have to serve it in wine glasses. I hope I’m not insulting any wine purists by dumping the whole bottle (minus a few sips to taste test it) in a pan with sugar, water and spice, but this is how I roll. You give me a foodstuff, I make said foodstuff into dessert. It’s what I do. It would be very good on its own, without the little bits of bittersweet chocolate throughout, maybe with some fresh cherries or other red or blue/black/purple berries…but then it would be more of a palate cleanser than a dessert. And I like dessert. The booziness never really goes away completely. Let’s talk about those books for a bit. You all know how much I love and rely on The Flavor Bible to spark my creative process. If I’ve convinced you to pick up a copy and put it to use, good! I hope you love it as much as I do…though if you do, you’re going to need What to Drink with What You Eat as well. Really. I can’t believe I’ve gone for so long without it. In addition to being an excellent way to learn a lot of the basics about wine quickly, it also covers EVERYTHING you could possibly drink. Including water. There’s even a nice, thorough tea section. As someone who seeks out flavors in unusual places, this just adds another dimension to what I can potentially do with flavors in my dessert experiments. The chocolate is a little big but it still tastes awesome. The spices in this may seem overpowering at first, even when it’s freshly churned, but will mellow out once it’s had a chance to set up. The only improvement I can suggest is to use bittersweet chocolate shavings (the chocolate MUST be bittersweet…I’ve decided this, don’t question it) or do it up straciatella-style, as it’s hard to balance big chips in bites of quickly-melting alcoholic sorbet. Place the wine, sugar and water in a deep saucepan. Add the spices and bring to a boil. Keep on a low boil for 5 minutes, until most of the alcohol has cooked off and the spices are apparent. Remove from heat. Remove as much of the spices as you can find with a small strainer and allow to come to room temperature (or chill over an ice bath if you’re in a hurry). 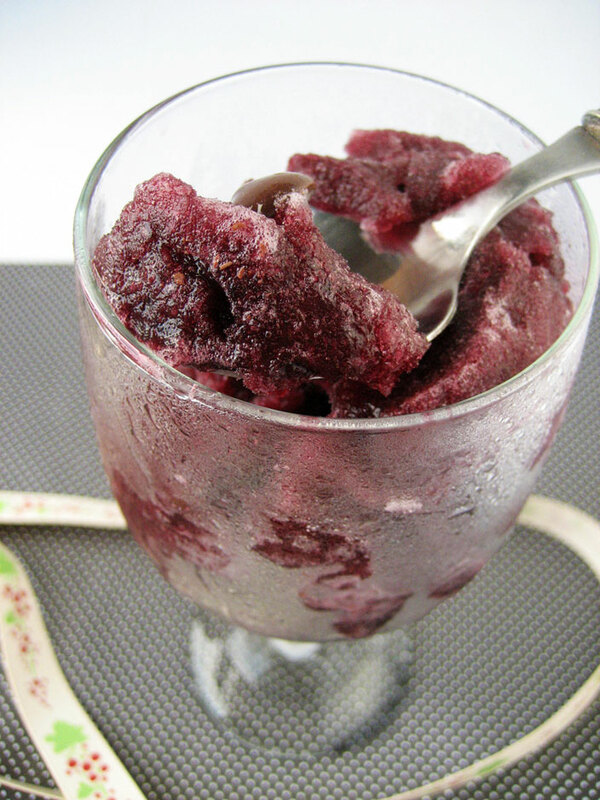 Strain completely into a medium-large bowl and place in the freezer for about 5 hours, until the mixture is slushy. Churn in an ice cream maker, mixing the chocolate chips in at the last few seconds of churning. 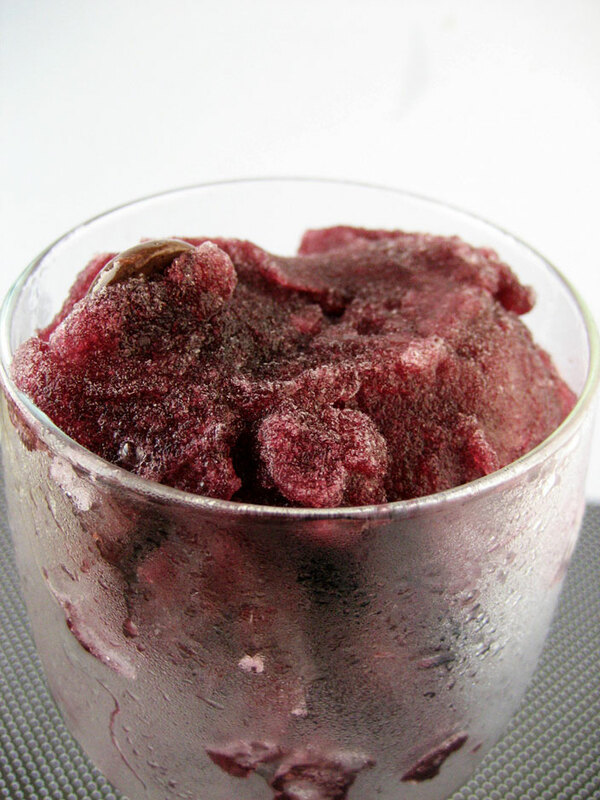 Remove to a chilled container and freeze several hours, until firm and scoopable. 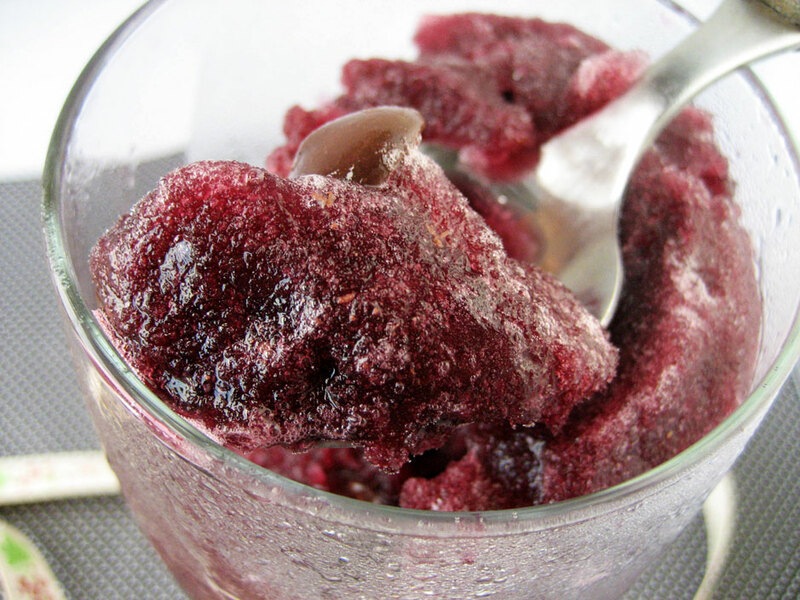 Yes, you do really need to pre-freeze the base until it’s slushy. And eat it in small quantities (or just very quickly). I just cooked pasta in a whole bottle of wine. I don’t think what you did or I did should be considered wasting. After all, wine is essentially a food. And as long as you enjoy it, it doesn’t matter what form it takes.